Topic to explore: what i know to be true, lessons from the week. Paper: Moleskine Journal Squared. This is just ordinary notebook paper. Media: Mostly dry mediums but some gelatos, watercolor brushes, crayons, etc. This idea also came completely from the Soul Comfort class. When Melody talked about the idea and showed some of her pages, I was immediately hooked. Coupled with the fact that I knew I wanted to focus on doodling this year, I decided this was a winner for 2014. 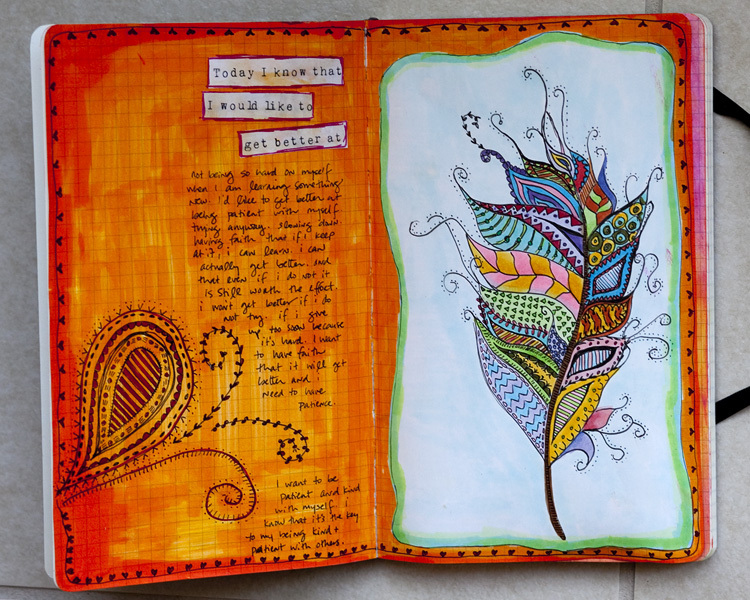 My goal for this project is to couple lots of journaling with doodling, sketching, and collage. And whatever else I am in the mood for. This is the first page I ever did and it’s a bit different than the ones that come next. As I did more pages, the idea expanded a bit and then settled down. As with the others, I am not married to a particular way and this might shift and morph but for now, I love what it is. Like the Listen with Intent project, I created a pinterest board for the ideas I want to try out. I am hoping to have a wide variety and to use this book to explore, have fun, and journal my heart out. The pages in this book are thin so even though I hadn’t intended to, I ended up glueing every other page just to get them to be a bit stronger, but I also plan to stick to dryer mediums which will be a fun and interesting challenge. The prompts are all from Melody and this first page says: Today I know that I would like to get better at…. and I wrote about not being so hard on myself when I am learning something new. And the feather art was inspired by Jane Monk Studio and I used copics to color the feather. Here’s to a year of meaningful and fun pages to record what I know. How fun this will be for you and for us to see. I love this first one, beautiful!! I really like this, and thanks for posting that link to the Pinterest board. There are so many great simple designs here, just the thing I was looking for today! This is beautiful. Love the feathers and colors. Very pretty! Your doodling looks great. I bought the same Moleskine book as you use but when I use watercolors or markers, they go through to the back pages. They curl also but that is not such a bad issue. How do you deal with that when you use watercolor etc on these thin paper pages?